Powerful APIs that enable you to send, receive and track email effortlessly. Why do you need SMTPeter? Sending emails can be complicated and time-consuming. By using SMTPeter you don't have to worry about complex things like DKIM signing, SPF, DNS hosting, DMARC or tracking clicks and opens. You send your messages to SMTPeter using REST or SMTP. The messages are processed and optimized, before they are delivered to the recipient's inboxes. You send your messages to SMTPeter using REST or SMTP. The messages are processed and optimized on our mail servers. Your message is then delivered to the recipient's inbox. What happens with your message on SMTPeter's servers? SMTPeter can add a DKIM signature to your email to allow receivers to validate that the message is legitimate. Hyperlinks are replaced and redirected over SMTPeter's servers to track and log all clicks. A new envelope address is installed to intercept and track bounces and out-of-office replies. SMTPeter prevents that receiving parties get flooded with more messages than they can handle. Stylesheets are automatically converted into inline style attributes for best results across populair email clients. A webversion link can automatically be added to your email. This page is hosted by SMTPeter. If you add variables to your email, your message will be personalized with recipient specific data. Embedded images can be stripped and externally hosted. This reduces the size of your messages. All emails that you send through SMTPeter are archived. You can use the dashboard or the REST API to access them. Even after your message is delivered, SMTPeter stays active to monitor all the feedbacks. Clicks, opens and bounces are tracked and you can get notifications through feedback loops. Where can you find everything? You can find all information about the data Peter receives like log files, statistics, DMARC reports, archived emails and more.. Through the reliable REST API you can easily download log files, analyze statistics or request messages..
You can use SMTPeter not only as an email gateway, but also as a centralized template store, where you can pre-store your templates. Using the API you can instruct SMTPeter to use these templates for personalised emails. 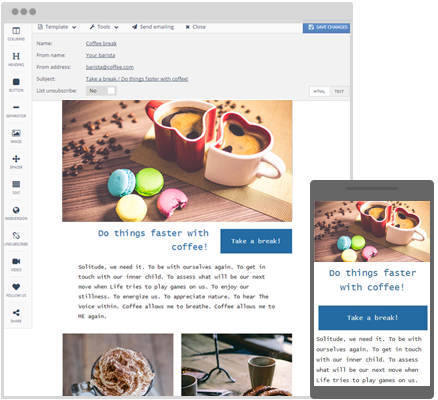 SMTPeter comes with a powerful drag-and-drop editor to manage and edit the templates without any knowledge of HTML. You can easily add desired elements such as images, links, share buttons, text, etc. As a bonus, the generated emails are responsive out of the box and work in all modern email clients. Besides the fancy drag-and-drop editor, you can use the HTML editor, which offers you more freedom and control in designing email templates. Your templates are stored as JSON objects and they are accessible through the dashboard or the REST API with a unique id. A SMTPeter license costs € 50 per month. For this price you can send up to 25.000 messages from one IP address and one domain name. If you send more messages, or when you use multiple IPs or multiple domains you will be charged extra. Enter the estimated amount of emails you send per month. Questions? Get in touch with our experts and learn more. Thank you for contacting us, we'll get back to you as soon as possible. What is your experience with SMTPeter? The automation and integration of transactional emails via SMTPeter is an easy process. Because of this, our people are able to spend their attention more efficiently on the product, and there is no time wasted. Thereby, the process of creating and managing the email templates in SMTPeter is simple but effective because of the drag and drop editor. Results are directly visible and live immediately, if desired. The experience with SMTPeter is good. The system is easy to integrate and user friendly. The REST API creates extended options regarding the sending of emails, which resulted in us optimizing our email. SMTPeter is made, maintained and supported by Copernica , a leading provider of high quality marketing software located in Amsterdam, The Netherlands. Get the latest SMTPeter news and updates! Please confirm your subscription by clicking on the link in the email.